The two-year-old Baby squeals with delight when she sees Maggie, the half-shepherd-half-rolling-stone dog. 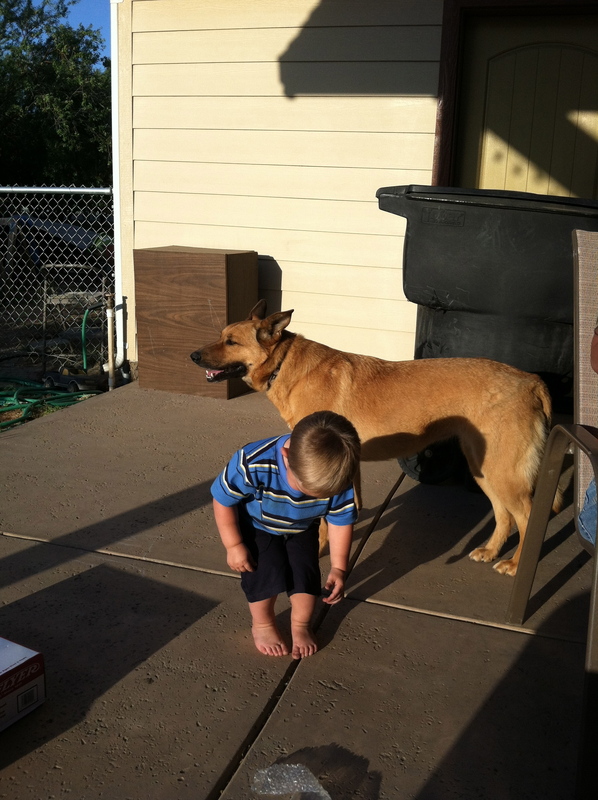 Baby LOVES Maggie and her shepherd-appearing brother Henry and they mostly love Baby also. Maggie tolerates some mighty eye-poking and only occasionally places both paws over her eyes to avoid Baby. Henry makes certain that he is busy with dog activities when it is eye poking time. Maggie and Henry are the supreme ranch dogs and they are in charge. Henry is a dog’s dog. He does all things perfectly. 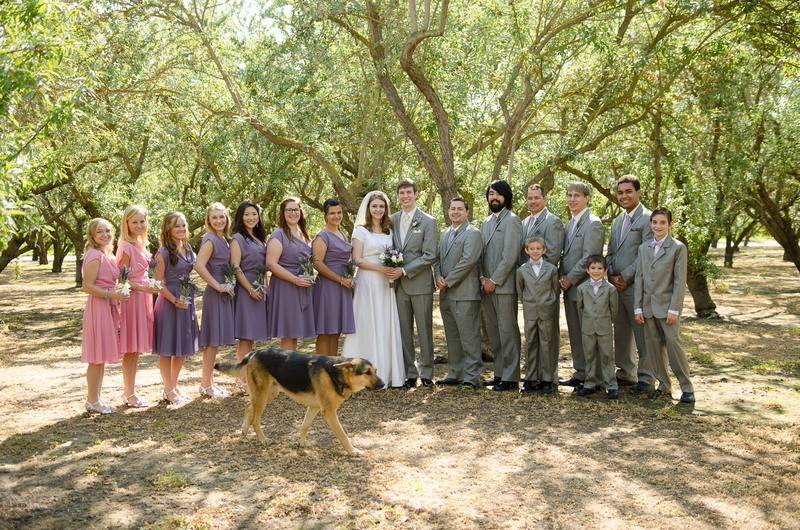 He knows exactly what is expected of him and only occasionally strays from the perfect dog path – as in when he photo-bombed the wedding. Maggie is fairly neurotic and hates all loud noises. Should someone slam a door a half mile away, she cowers and runs in the laundry room – which of course delights Baby because that is where some of the best eye-poking takes place. Maggie does not know how to behave like a dog. She needs to watch Henry more often. Babies need dogs. I should say that they need tolerant, non-nipping dogs. The house cats just won’t cooperate and allow cuddling around here. They hide and remain aloof. Babies need soft furry things to squeeze. Buppies allow squeezes. 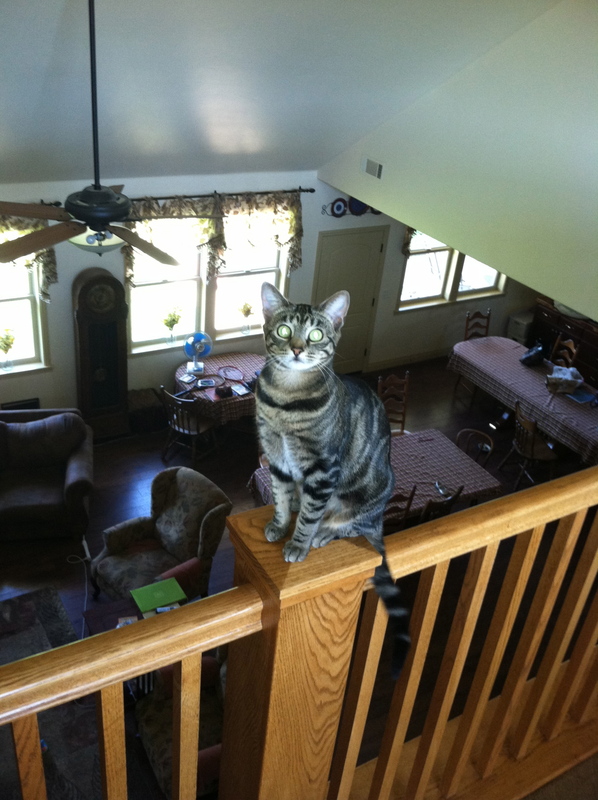 Cats escape to the most unreachable point in the house.